It takes more than Tor to stay anonymous. Make sure you read the documentation on the Tor Project's website. Do you use Tor to prevent Big Brother from tracking you online? Although it is pretty straightforward to use, it can be quite a hassle to configure Tor on all your Internet-enabled devices. You can save yourself a lot of hassle by using a Raspberry Pi as an anonymous wireless access point. 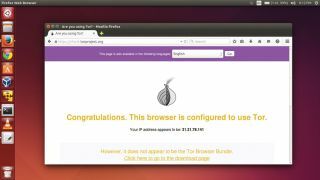 The Pi will dole out an IP address, and any device that's connected to it will be able to access the Internet via the Tor network. A Raspberry Pi along with an SD card with the Raspbian distro. If you haven't done this before, follow our walkthrough to get Raspbian up and running. You'll also need an Ethernet cable. Hook one end into the Pi's Ethernet port and the other into your wireless router. This is how the Pi will connect to the Internet. You'll also need a USB Wi-Fi adaptor that's compatible with the Raspberry Pi. If you haven't got one yet, check the list of compatible adapters that are known to work on the Pi. In the same file, scroll down and uncomment the word authoritative; by removing the # in front. In these lines we define the IP address of our Pi access point (192.168.12.1), the range of the IP addresses it'll hand out to connected devices (from 192.168.12.5 to 192.168.12.50) as well as the address of the domain name servers (8.8.8.8 and 8.8.4.4). You can change any of these values as per your preference. Save the file (Ctrl+X) once you're done. We'll now edit the /etc/default/isc-dhcp-server to specify the interfaces that our new DHCP server should listen to. Open the file and scroll down to the line that reads INTERFACES="". Insert wlan0 between the quotes so that it now reads INTERFACES="wlan0", and save the file. We've set up a password-protected network called TorSpot. You can specify a different name for the access point by specifying it in the ssid= string. Also change the wpa_passphrase= string to specify a custom password. You'll need to enter this password to authenticate yourself to the Pi's access point. Next up, we'll tell the Pi where to find this configuration file by pointing to it in the /etc/default/hostapd file. Open the file, find the commented-out line that reads #DAEMON_CONF="" and uncomment and edit it to read DAEMON_CONF="/etc/hostapd/hostapd.conf". What this does is loads the rules when the devices are activated on boot. If you get an 'unknown driver' error, read our section on 'Your own hostapd'. If everything goes well, the wireless access point (TorSpot) is listed in the list of available Wi-Fi hotspots. You can connect to it from another computer or a smartphone and authenticate using the password you specified in the hostapd.conf file. When connected, you should be able to browse the Internet normally. When the Raspberry Pi is back up again, you'll be able to connect to the new access point and browse normally. Verify your traffic redirection rules with the sudo iptables -t nat -L command. These settings inform Tor about the IP address of our access point and ask it to anonymise any traffic that flows over it. In the previous section, we've already configured the /etc/network/interfaces file to load the contents of this file when the interfaces are activated. That's it. Now restart the Pi. When it's back up again, you'll be able to connect to the Pi hotspot, TorSpot, as before. However, unlike as before, all your traffic will now be routed through the anonymous Tor network. You can verify that this is happening by heading to check https://torproject.org from any device that's connected to TorSpot. The page will also list your IP address, which will not be that of your ISP. Visit this page from another device connected to TorSpot and it'll show a different address. Congratulations, you can now anonymously browse the web on all your devices! Use the tail -f /var/log/syslog common to keep an eye on the devices connected to your Tor hotspot. If you get Locale errors when connected to the Pi remotely, make sure you don't forward your locale by editing /etc/ssh/ssh_config and commenting out the SendEnv LANG LC_* line. Use the tail -f /var/log/syslog command to keep an eye on all system messages. This might come handy if you are unable to connect to the Pi hotspot. We've used Google's DNS service in this tutorial, but you can use another service like OpenDNS or your ISP's DNS servers by pointing to them in the /etc/dhcp/dhcpd.conf file.